In September 2013 one of our favorite organizations, Women’s Voices for the Earth, launched a really important campaign. We are proud to be a part of the No Secrets campaign and talk about what it is and how we’re involved. 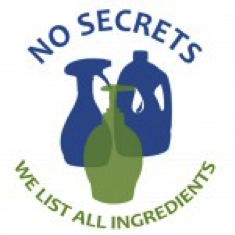 The No Secrets campaign (http://www.womensvoices.org/issues/secret-scents/no-secrets-companies/) is a collection of companies that have pledged to fully disclose all ingredients in their products, including fragrance. No Secrets companies are committed to full transparency to allow consumers to understand exactly what ingredients are used in their homes. You mean companies don’t have to list ingredients? In the US, companies are NOT obligated to list the ingredients in cleaning products. Only some companies choose to list the ingredients they use. What do you mean, “including fragrance”? Many companies that disclose their ingredient lists have something called “fragrance”. This word indicates some combination of chemicals, often including allergens. By only seeing “fragrance” on a label, there is no way to know which of the hundreds of potential ingredients are present. In Europe, if a fragrance formula includes any of 26 common allergens, companies must disclose this information. As a result, many companies comply with the European laws to list common allergens, but do not label their US products similarly! So consumers may be getting products with common allergens in them, but have no way to tell this by reading the label. Only by avoiding fragrance completely, or by using products that disclose the full fragrance ingredients, can US consumers know if these allergens are present. No Secrets companies are committed to disclosing all of this information. What is Meliora K doing to disclose information? As you’ll learn from this site and blog, we have a strong bias towards sharing information. At a conventional company, this would be a big problem (that’s one reason we got started – they see this as a problem but we see this as an advantage!). We do several things to contribute to our oversharing. Simple Ingredients, and Fragrance-Free. The fewer items you need to read through to understand what’s in your products, the better. Full Ingredient Disclosure on website. So you can understand what’s in it before you buy. Do your research online while you can research each of the ingredients easily. Full Ingredient Disclosure on products. Out of laundry soap and wrangling kids through the cleaning products aisle is not the time to do wonder if you’ll be able to get a full ingredient list. Whether you’re shopping online or in a store, we get the information to you and clearly display the full ingredients on the packaging. Full Recipe Disclosure online and on products. Here’s where our company starts moving from “best practice” to “leader” in the disclosure area. Some call it oversharing, but we thing the best way to understand what you’re using is to hear how we make it, or even try it yourself. We love the idea of No Secrets and we’ll continue to look for ways to give you as much information as you want as you learn more about our products. Want to learn more about our business practices and products? Contact us to suggest topics!